Axios is reporting that health care costs for workers is rising while overall costs of employer-based health benefits is growing modestly from year to year. This is slowly eating up all of the average workers wage increases, and then some, as reported by the Kaiser Family Foundation’s 2018 Employer Health Benefits Survey. The survey covers the last ten years, from 2008 to 2018. Most of where the employees are paying for health care comes from deductibles, which has seen a +212% increase over that period, and is out of pocket. These costs, the survey said, is rising faster than inflation and wages. Premiums for families have risen over this period +55%, while workers’ earnings have risen +26%, and inflation has risen +17%. According to Kaiser, employees are paying an average of about $1,200 per year in premiums. That’s 65% more than what they paid in 2008, for single coverage plans that cover only the worker, no family members. Besides the increase in deductibles, the number of employees who have a deductible has gone up, and the number of employees with above-average deductibles is up as well. More patients are more attuned to the high costs of care. The underlying cost of health care services is growing relatively slowly right now, compared to historical trends. But there’s a sense, at least among some liberal-leaning health care experts, that employers have just about maxed out their ability to shift more costs onto employees — meaning that once price increases start to pick up steam again, businesses and workers will both feel the pain quickly. As workers’ wages are stagnant, and health care costs are rising, shifting the cost of health care onto the backs of workers is not only counterproductive to lowering the cost of health care, it puts an undue burden on those who can least afford to shell out more of their hard earned income on health care, especially when they have a serious medical issue to deal with. Single payer will relieve the worker from having to pay out of pocket when wages are stagnant, and when wages rise again. This will enable them to have more money to spend on things that otherwise would have been prohibitive before. To do no less is to saddle the working class with perpetual debt and decreased economic power. Not a good way to run an economy. This entry was posted in deductibles, employee costs, Employees, Employer Costs, Health Care, Health Care Costs, Health Care Reform, premiums, Single Payer, Wages and tagged Costs, deductibles, Employee Benefits, Employees, Employers, Health Care, Health Care Costs, Inflation, Medical Costs, premiums, Single Payer, Wages on October 4, 2018 by Transforming Workers' Comp. In my recent review of the Introduction to Health Care under the Knife, the term “neoliberalism” was discussed as one of the themes the authors explored in diagnosing the root causes of the failure of the American health care system. As defined in Wikipedia, and as I wrote in my review, neoliberalism refers primarily to the 20th-century resurgence of 19th-century ideas associated with laissez-faire economic liberalism. Those ideas include economic liberalization policies such as privatization, austerity, deregulation, free trade and reductions in government spending in order to increase the role of the private sector in the economy and society. These market-based ideas and the policies they inspired constitute a paradigm shift away from the post-war Keynesian consensus which lasted from 1945 to 1980. Yet, the full impact of neoliberalism was not felt until the rise of the TEA Party in the run-up to the passage of the Affordable Care Act, or Obamacare, and that led to the Freedom Caucus in the House that has tried unsuccessfully multiple times to repeal and replace Obamacare with basically nothing. Economist Said E. Dawlabani, in his book, MEMEnomics, describes the period from 1932 to 1980, which includes the post-war Keynesian consensus, as the second MEMEnomic cycle, or “Patriotic Prosperity” MEME. The current period, from 1980 to the present, represents the third MEMEnomic cycle, or the “Only Money Matters” MEME. It is in this period that the American health care system underwent a radical transformation from what some used to call a “calling profession” to a full-fledged capitalist enterprise no different from any other industry. This recrudescence of 19th century economic policies did not spring forth in 1980 fully formed, but rather had existed sub-rosa in the consciousness of many American conservatives. In the early 1970’s, Richard Nixon’s administration came up with the concept of the Managed Care Organizations, or MCOs, as the first real attempt to apply neoliberalism to health care. As we shall see, this would not be the first time that neoliberal ideas would be implemented into health care reform. In Chapter Seven, of their book, Health Care under the Knife, authors Howard Waitzkin and Ida Hellander, discuss the origins of Obamacare and the beginnings of neoliberal health care reform. They point to the year 1994 as a significant one for reform worldwide, as Colombia enacted a national program of “managed competition” that was mandated and partially funded by the World Bank. This reform replaced their prior health system and was based mostly on public hospitals and clinics. 1994 was also the year when then First Lady, Hillary Clinton spearheaded a proposal like the one Colombia enacted that was designed by the insurance industry. I am sure you all remember the Harry and Sally commercials that ran on television that sank her proposal before it ever saw the light of day? Insurance companies, they also said, profited by denying or delaying necessary care through strategies such as utilization review and preauthorization requirements; cost-sharing such as co-payments, deductibles, co-insurance, and pharmacy tiers; limiting access to only certain physicians; and frequent redesign of benefits. These proposals, the authors state, fostered neoliberalism. They promoted competing for-profit private insurance corporations, programs and institutions based in the public sector were cut back, and possibly privatized. Government budgets for public-sector health care were cut, private corporations gained access to public trust funds, and public hospitals and clinics entered competition with private institutions, with budgets determined by demand rather than supply. Finally, prior global budgets for safety-net institutions were not guaranteed, and insurance executives made operational decisions about services, superseding the authority of physicians and other clinicians. The roots of neoliberal health reform emerged from the Cold War military policy, and the authors cite economist Alain Enthoven providing much of the intellectual framework for those efforts. Enthoven was the Assistant Secretary of Defense under Robert S. McNamara during both the Kennedy and Johnson administrations. While he was at the Pentagon, between 1961 and 1969, he led a group of analysts who developed the “planning-programming-budgeting-system” (PPBS) and cost-benefit analysis, that intended to promote more cost-effective spending decisions for military expenditures. Enthoven became the principal architect, the authors indicate, of “managed competition”, which became the prevailing model for the Clinton, Romney, and Obama health care reforms, as well as the neoliberal reforms around the world. 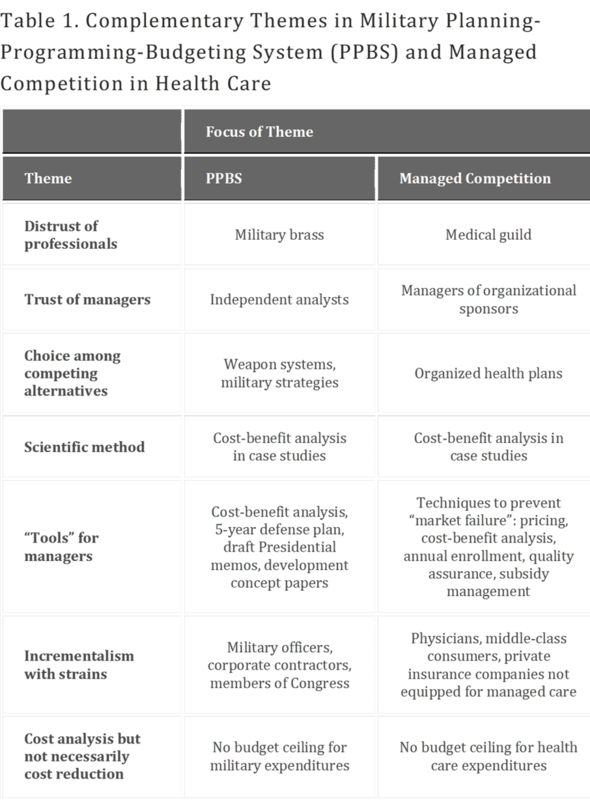 The following table highlights the complementary themes in the military PPBS and managed competition in health care. Sources: See note 11, page 273. Enthoven continued to campaign for his idea throughout the 1970s and 1980s and collaborated with managed care and insurance executives to refine the proposal after being rejected by the Carter administration. The group that met in Jackson Hole, Wyoming, which included Enthoven and Paul Ellwood, was funded by the five largest insurance corporations, as well as the 1992 Clinton presidential campaign, and wife Hillary’s Health Security Act. The authors state that Barack Obama, while a state legislator in Illinois, favored a single payer approach, but changed his position as a presidential candidate. In 2008, he received the largest financial contributions in history from the insurance industry, that was three times more the contributions of his rival, John McCain. The neoliberal health agenda, the authors write, including Obamacare, emerged as one component of a worldwide agenda developed by the World Bank, the International Monetary Fund, and other international financial institutions. The agenda to promote market-driven health care, facilitated access to public-sector health and social security trust funds by multinational corporations, according to Waitzkin and Hellander. The various attempts in the US by the Republican Party to privatize Social Security is an example of this agenda. An underlying ideology claimed that corporate executives could achieve superior quality and efficiency by “managing” medical services in the marketplace, but without any evidence to support it, the authors contend. Health reform proposals from different countries have resembled one another closely and conform to a cookie-cutter template. Table 2 describes the six features of nearly all neoliberal reform initiatives. † Sources: patients, employers, public sector trust (“solidarity”) funds (the latter being “contributory” for employed workers, and “subsidized” for low income and unemployed). ‡ Sources: patients, public sector trust funds – Medicaid, Medicare. Organizations of providers – large, privately controlled organizations of health care providers, operate under direct control or strong influence of private insurance corporations, in collaboration with hospitals and health systems, may employ health care providers directly, or may contract with providers in a preferred network. In Obamacare, they are called Accountable Care Organizations (ACOs), supported only in Medicare, but Obamacare accelerated organizational consolidation in anticipation of broader implementation. In this model, for-profit managed care organizations (MCOs) offer health plans competitively. In reality, competition is restrained by the small number of organizations large enough to meet the new laws’ financial and infrastructure requirements, as well as by the consolidation in the private insurance industry. They contract with or employ large numbers of health practitioners. Instead, physicians and hospitals are absorbed into MCOs. Organizations of purchasers – large organizations purchasing or facilitating the purchase of private health insurance, usually through MCOs. Under Obamacare, the federal and state health insurance “exchanges”—later renamed “marketplaces” to reflect reality of private, government-subsidized corporations—fulfill a similar role. Constriction of public hospitals and safety net providers – public hospitals at the state, county, or municipal levels compete for patients covered under public programs like Medicaid or Medicare with private, for-profit hospitals participating as subsidiaries or contractors of insurance companies or MCOs. With less public-sector funding, public hospitals reduce services and programs, and many eventually close. Under Obamacare, multiple public hospitals have closed or have remained on the brink of closure. Note: This is a subject I have written about in prior posts about Medicaid expansion. 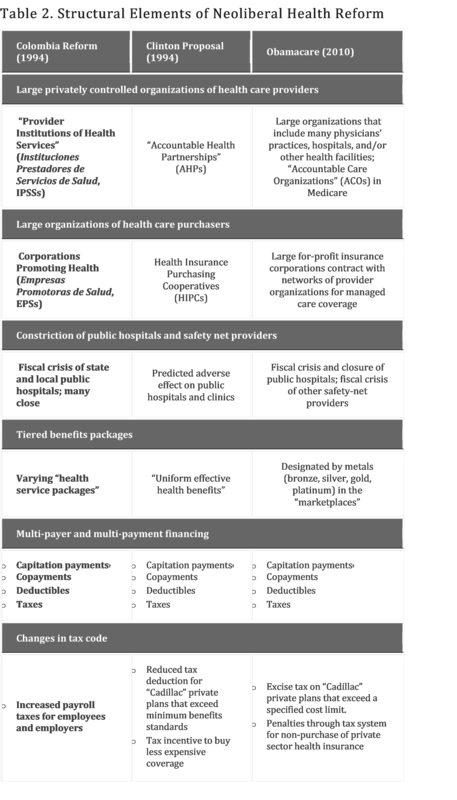 Tiered benefits packages – defined in hierarchical terms, minimum package of benefits viewed as essential, individuals and employers can buy additional coverage, poor and near poor in Medicaid eligible for benefits that used to be free of cost-sharing, but since Obamacare passed, states have imposed premiums and co-payments. Under Obamacare, various metal names—bronze, silver, gold, platinum, identify tiers of coverage, where bronze represents the lowest tier and platinum the highest. 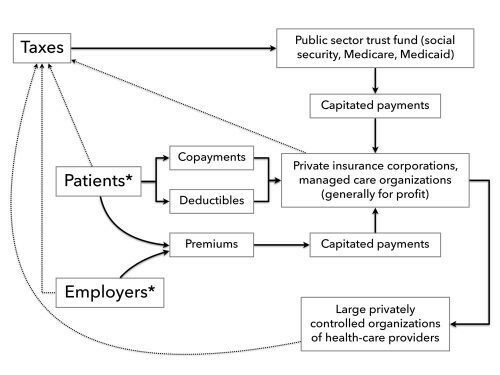 Complex multi-payer and multi-payment financing – financial flows under neoliberal health policies are complex (see Chart 7.1). There are four sources of these various financial flows. Outflow of payments – each insured person considered a “head” for whom a “capitation” must be paid to an insurance company or MCO. Inflow of funds – funds for capitation payments come from several sources. Premiums paid by workers and their families, contributions from employers is a second source. Public-sector trust funds are a third source, co-payments and deductibles constitute a fourth source, and taxes are a fifth source. Changes in the tax code – neoliberal reforms usually lead to higher taxes because they increase administrative costs and profits, Obamacare reduces tax deductions and imposes a tax for so-called Cadillac insurance plans. In addition, it calls for penalties for those who do not purchase mandatory coverage, administered by the IRS. I was unable to get on the ACA because I had not filed a return in several years due to long-term unemployment because of the financial collapse of 2007/2008, and the subsequent jobless recovery. *Purchase of insurance policies for employers and patients mediated by large organizations of health care purchasers. What is the outlook for single payer in the US, the authors ask? They cite national polls that show that about two-thirds of people in the US favor single payer. See Joe Paduda’s post here. If the US were to adopt single payer, the PNHP proposal would provide coverage for all needed services universally, including medications and long-term care, no out-of-pocket premiums, co-payments, or deductibles; costs would be controlled by “monopsony” financing from a single, public source, would not permit competing private insurance and would eliminate multiple tiers of care for different income groups; practitioners and clinics would be paid predetermined fees for services without and need for costly billing procedures; hospitals would negotiate an annual global budget for all operating costs, for-profit, investor-owned facilities would be prohibited from participating; most nonprofit hospitals would remain privately owned, capital purchases and expansion would be budgeted separately, based on regional health-planning goals. Funding sources would include, they add, would include current federal spending for Medicare and Medicaid, a payroll tax on private businesses less than what businesses currently pay for coverage, an income tax on households, with a surtax on high incomes and capital gains, a small tax of stock transactions, while state and local taxes for health care would be eliminated. From the viewpoint of corporations, the insurance and financial sectors would lose a major source of capital accumulation, other large and small businesses would experience a stabilization or reduction in health care costs. Years ago, when I first considered single payer, I realized that if employers no longer had to pay for health care for their employees, they could use those funds to employ more workers and thus limit the impact of recessions and jobless recoveries. So how do we move to single payer and beyond? According to the authors, and to this reporter, the coming failure of Obamacare will become a moment of transition in the US, where neoliberalism has come home to roost. This transition is not just limited to health care. The theory of Spiral Dynamics, of which I have written about in the past, predicts that at the final stage of the first tier, or Existence tier, the US currently occupies, there will be a leap to the next stage or tier, that being the Being tier, where all the previous value systems have been transcended and included into the value systems of the Being tier. We will need to address, the authors contend, with the shifting social class position of health professionals and to the increasingly oligopolistic and financialized character of the health insurance industry. The transition beyond Obamacare, they point out, will need to address also the consolidation of large health systems. Obamacare has increased the flow of capitated public and private funds into the insurance industry and extended the overall financialization of the global economy. The authors conclude the chapter by declaring that as neoliberalism draws to a close, and as Obamacare fails, a much more fundamental transformation needs to reshape not just health care, but also the capitalist state and society. To sum it all up, all the attempts cure the ills of health care by treating the symptoms and not the cause of the disease will not only fail, but is only making the disease worse, and the patient getting sicker. We need radical intervention before the patient succumbs to the greed and avarice of Wall Street, big business, and those whose stake in the status quo is to blame for the condition the patient is in in the first place. Therefore, Obamacare is the last stage of neoliberal health care reform. This entry was posted in ACA, Access to care, ACO, Affordable Care Act, Capitalism, Capitation, Colombia, Federal Government, financialization, Health Administration, Health Care, Health Care Benefits, Health Care Costs, Health Care Reform, Health Insurance, Health Plans, Health Policy, Hospital Closings, Hospital Systems, Hospitals, Insurance, libertarianism, managed care, Mandated health care, Medicaid, Medicaid Expansion, MEDICAL COSTS, Medicare, Medicare for All, MEMEnomics, Neoliberalism, physicians, PNHP, premiums, private funding, proletarianization, public funding, reform, Single Payer, Spiral Dynamics and tagged ACA, ACOs, Affordable Care Act, Capitalism, Capitation, co-payments, deductibles, Health Care, Health Care Costs, Health Care Reform, health systems, Hospitals, Insurance companies, MCOs, Medicaid, Medical Costs, Medicare, Medicare for All, Neoliberalism, Obamacare, PNHP, Single Payer on April 25, 2018 by Transforming Workers' Comp.